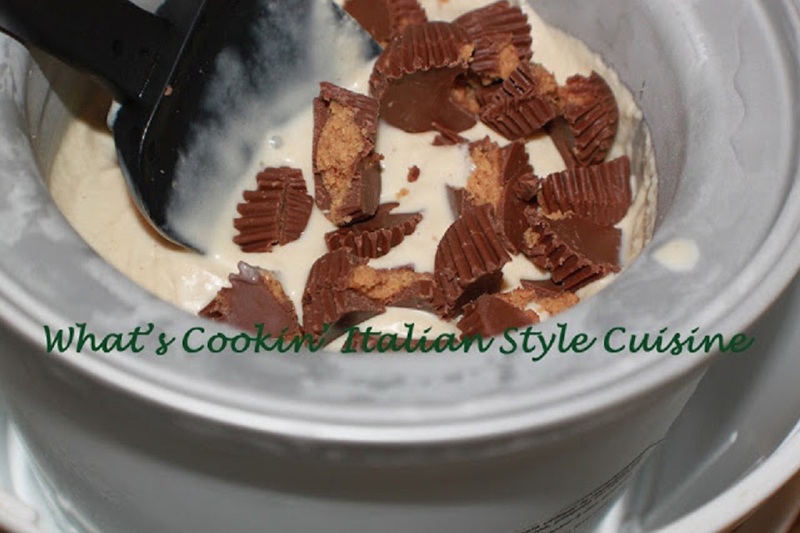 Here is a great recipe for Peanut Butter Cup Ice Cream. Easy, quick with pure ingredients. I guess that's the best part of making it yourself knowing exactly what's in it! So besides this being fun, you can adapt this to anything you really love to add or make any kind of ice cream you like. I love the creamy smooth confection and with the addition of one of our favorite candy, the peanut butter cup, it's the perfect treat for any occasion or peanut butter lovers craving at al! I don't know what took me so long to make homemade ice cream. My infinitive creations awaits me. I am now additive to homemade ice cream, you will be too after you try this one! Beat these together with an electric hand mixer until well blended. Then add and beat in 1 cup whole milk. Stir in 2 cups heavy cream by hand with a spoon or spatula. Place mixture in your ice cream maker tub according to the instructions in your units manual. Mine takes approximately 25 minutes. Five minutes before it's done, fold into this mixture around 1 cup chopped peanut butter cuts. Pour into a freezer container and store for around 3 weeks if it lasts that long.